Cava is the term used by Spain to designate their wonderful sparkling wines. Although not region, almost all of the bodegas producing Cava are in the Penedes wine region of Spain just south of Barcelona. A short train ride of 45 minutes from the Plaza Cataluña in Barcelona will get you to the Cava town of St. Sadurni. In St. Sadurni you can walk the town and gaze at the many Cava bodegas that make their home here. If you are in Barcelona, take a day or half day to tour one of the two great houses of Cava, Codorniu or Freixenet. Codorniu is a 15-minute walk from the train station and Freixenet is directly opposite the train station. To get to St. Sadurni d’Anoia, take the train from the Plaza Cataluña, Sants, or Arc de Triomf in the direction of St. Vince de Calders or Vilafranca. Get off the train at the stop of St. Sadurni. Explore the Cave wine region! Codorniu – Largest Cava producer. 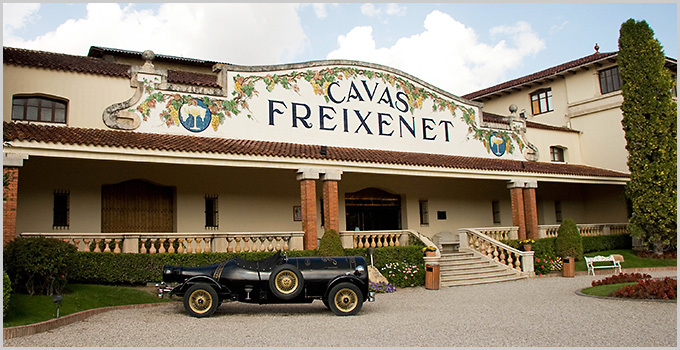 Freixenet – Established in 1898, popular in U.S.
Segura Viudas Sustainable farming, guided walking tour.